Turf Pro LLC in Prairieville provides a comprehensive line of services to create, modify, or maintain the full landscaping potential of your property. Few things are more unsightly and detrimental to your grass and plants than weeds, which overtake the space other plants need to grow. Turf Pro LLC has the products and methods to remove any type of weeds and prevent them from returning. We target the weeds that need attention and control them by applying the correct herbicides for that particular species. Any weeds that are within the canopy of the plant are mechanically controlled. Our expert landscapers can also make recommendations to protect your plants and set up a maintenance schedule for follow up applications. Irrigation systems can be as simple as watering the grass in your yard correctly, or as complex as maintaining all the green areas of a golf course. Turf Pro LLC works with home and business owners to develop, maintain, and repair irrigation systems of any type. We’ll work with you to ensure every area of your property has the right amount of moisture, chemical balance, and nutrients. Turf Pro LLC offers every type of lawn care service, including cutting your grass, fertilizing, repairing bare patches, disease and weed control, and planting new grass. We work with residential and commercial properties of all sizes, taking care of the grunt work so you can focus on enjoying outdoor activities. If you want to enhance your property with new and customized landscape elements, Turf Pro LLC offers complete installation services. From planting new grass, trees, and bushes to building complex garden landscapes, our designers can meet any requirements, large or small. Our team of landscapers also offers flower bed maintenance. We plant and replace flowers, water flowers and plants, fertilize the soil, and add decorative elements such as rocks and mulch. 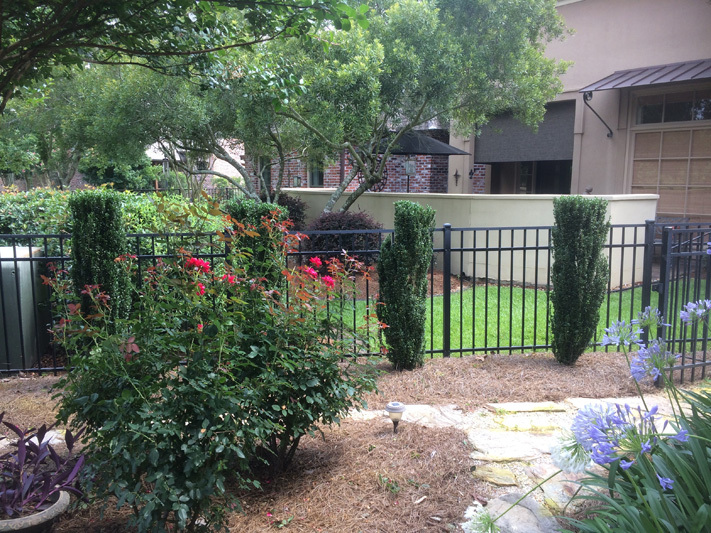 We also build specialized fencing for any size flower bed. From tending small window sill displays to maintaining commercial flower beds, Turf Pro LLC offers the most reliable service in the Baton Rouge area.